Please use any of the content below as you wish. Everyone has their own reasons for going on a boot camp. Mine were fairly simple. I’d started on a downward spiral with my lifestyle choices and in turn had put on weight. Instead of addressing it, I ignored it. I saw I had 6 clear days in my diary and decided to give myself a kick start – on my own, somewhere in the sun. A friend sent me a link to Steve’s website. I decided to send him a last minute email and if he could accommodate me, great, if not I had the perfect excuse! I had a response almost immediately and although I had left if to the last minute (literally!) he built me a tailor made break, arranged accommodation, food, transfers to and from the airport and a full agenda with regards to fitness. The whole trip was very uncomplicated. Other than my flights which I chose to suit what I could do, he took care of everything. The fitness side was possibly the toughest few days I have ever endured. The exercise was varied and intense, taking place on the beach, running track and in the gym. Activities ranged from HIT sessions to, boot camps, circuit training and even joined in my first yoga class. We incorporated Krav Maga in to what we did which was a huge bonus as I took away some incredible techniques which can be used for self defence in real life situations, all picked up while doing exercise. I’m not going to lie, The first few days I ached immensely. Negotiating the steps to my apartment was a huge task and spending relaxation time to recover by the pool was a welcome break until getting up from the sunbed which again took a massive amount of effort! 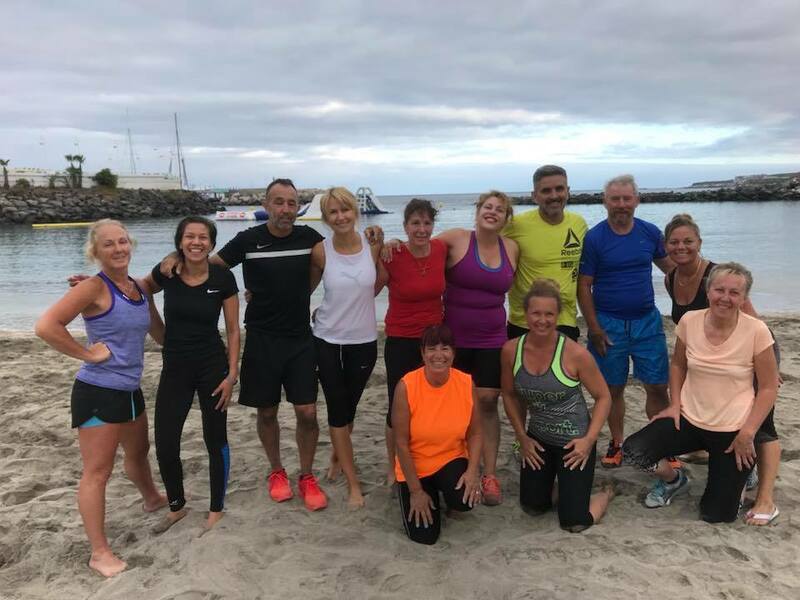 I had only lost my way with regards to my fitness in a short time before I came out to Tenerife but my body felt like it hadn’t done anything for years! I couldn’t remember the last time I’d had 2 clear days with out alcohol – even if it was only having the one glass in the evening but I can honestly say, I didn’t really feel like one. I was in bed early – out of choice and although some nights I slept better than others, I looked forward to the next day and although my body felt like it had taken a battering, once I was out and started training, it was fine again. I achieved more in the six days I was over than I could ever have imagined. I hoped I’d lose weight and tighten everything up which I definitely did but I had a detox from drink, my eating got back on track and I never felt hungry. I was given some great advice which I will take away, for example when to eat after exercising and various exercises which I will use ongoing. I am on the plane coming home feeling, lighter, refreshed and so much healthier. I feel like I’ve a really productive time and really enjoyed myself. I can’t recommend a boot camp with Steve enough. He was punctual, organised, easy to get on with, pushed to achieve the results I wanted to get without making it a chore and after meeting some of his clients at the group sessions I attended, they spoke so highly of him some being with him for 20 years. It was one of the the best decisions I have ever made.